Bought from a local nursery at a third off. I do like a bargain. 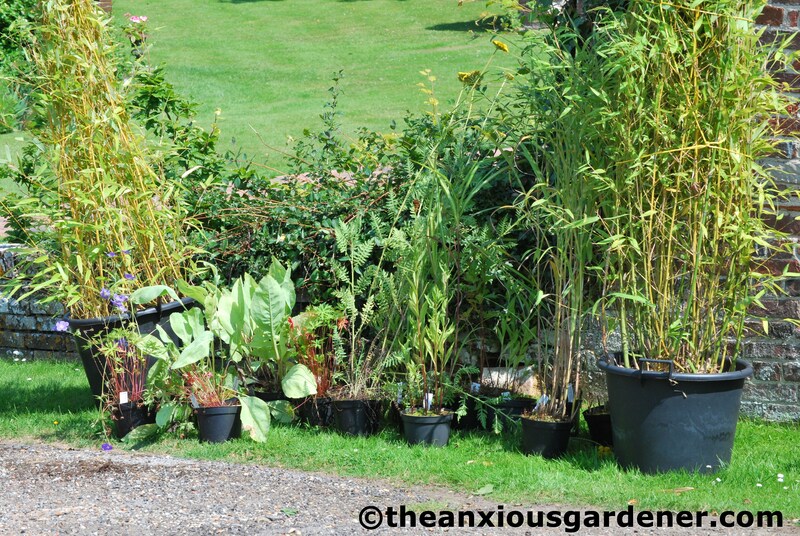 More bamboos, more rudbeckias, more grasses, more achilleas ….. 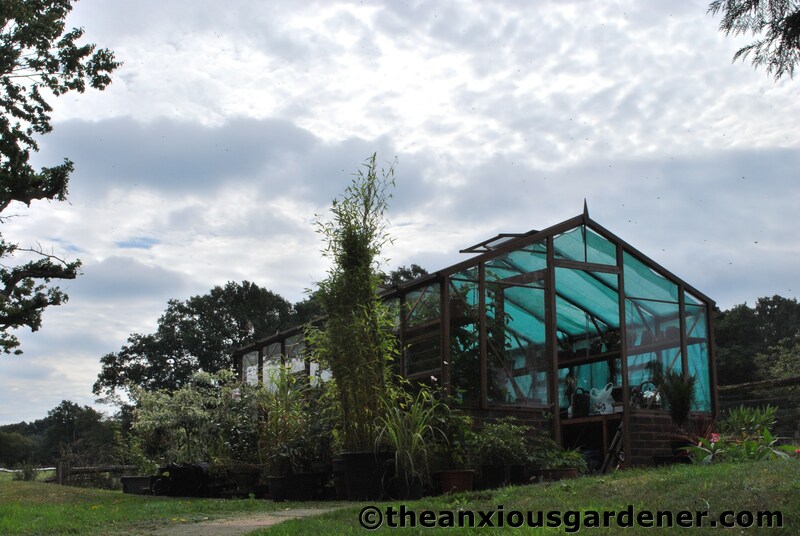 The sheer number of plants stored around the greenhouse is a worrying reminder of how much planting I’ve got to get on with. Some are grown from seed, some from cuttings, some are divisions, some bought in; it’s beginning to resemble Sleeping Beauty’s Castle. I shall soon need a machete to reach the door. But by the hair on my chinny chin chin, if I have to buy every plant in East Sussex, I WILL make this garden beautiful. Or at least full. I've finally started planting some of the above now – at long last! Am going to investigate getting some help over the winter – when I've got a bit of spare time. Hurrah, someone with a bigger(much bigger) backlog than me. But you've got the space for them. Go Dave! Have you got your teams of horticultural students/volunteers yet? Thanks, Faisal. I am reassured and now at ease. Hi Andrea, no thankfully I'm not a hoarder except maybe of books. Are you off on your walk? I think it was about now you were due to go. Hope you have a brilliant time – I'm sure you will. Wish I was coming with you…. Hi Stacy, with plants in pots we can really plant all year round just as long as the ground isn't frozen or sopping wet. But really I want to get most of this stuff planted whilst the ground is still warm. The roots should then do some growing before winter sets in. It's impossible to have too many rudbeckias. (Which isn't–necessarily–meant to be encouragement to go buy even more.) How late does planting season run for you? Achillea only seems to stand up straight when it grows in vicious amounts of sunshine. Oh the garden is going to be even more beautiful!! I think you are a horder but the best kind, not the sort that keeps every plastic bag, shoe box or bread tye or do you? and how many tea cups in the potting shed? NNNOOOO, Dave, you're not overdoing it at all! Impossible! Who'd ever think such a thing?! Hi Janet, your faith in me is quite remarkable but gratefully received. No not yet. I'm going to look into the possibility of extra help over the winter – now that autumn is almost upon us. There is talk of opening the gardens to the public. Eeek. Yikes. Crumbs. I would certainly have to have help were that to happen. Having read recently about your marvellous TNG, I was wondering whether you could send him over a couple of days a week? I'd pay his transport costs but he'd have to bring his own packed lunch. I've got a couple of fruit beds, Sara, up behind the greenhouse and increasingly they are being filled not with fruit but with spare plants awaiting a permanent home. I may build two more …..
Hi Petra, I have quite a lot of self sown freebies too. My favourite kind. I grow achillea up through a support, as yes they are terribly floppy. Doesn't look too hot when the plants are small but the supports are soon lost to view. Wow! That is a lot of plants! Though, I have a nice collection of plants stacked around the greenhouse now too. Mine though are all freebies! Lovely little gifts that have decided to self seed and grow in the path adjacent to the borders! Such a joy. One question, I love achilleas too. I have the pink varieties, but mine are terribly floppy. Do you stake them? Ahhh I SO sympathise. Have similar herculean tasks facing us here, though on a slightly smaller scale. Hmm and a few more bargain plants arriving next month. Who knew you could spend clubcard points on plants… dangerous! I'm betting on full AND beautiful – though that is certainly an impressive amount of planting to do… Any progress on finding a willing volunteer or three?